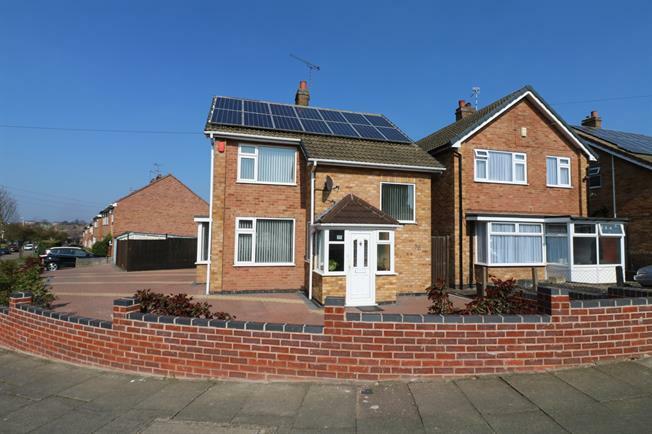 3 Bedroom Detached House For Sale in Leicester for Offers Over £290,000. This fantastic detached property benefits from a single storey extension to the rear which accommodates both a wet room and either a second reception room or alternatively a ground floor fourth bedroom. In addition there is also a spacious lounge/diner with an attractive feature fireplace and windows to both front and side elevations and well-proportioned fitted kitchen and entrance hall. To the first floor there are three double bedrooms and a family bathroom. The accommodation is well presented with uPVC double glazed windows throughout and gas fired central heating via a combination boiler. To the outside there is a block paved driveway that provides off-road parking for a number of vehicles as it wraps around both the front and side of the house. There is also direct car access to a garage. To the rear is a landscaped garden enclosed with tall timber panel fencing. The plot would allow scope for further extension subject to local planning permission.